You may have already heard about the future EMV credit card acceptance requirement. 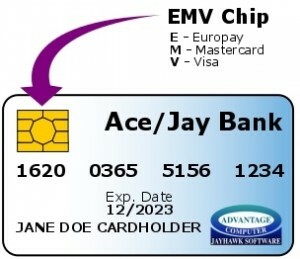 As of October 1st, 2015, all card reading equipment must be upgraded to accept EMV chip-enabled cards. There is a liability shift that has occurred where merchants who do not have EMV-ready equipment will be held liable for damages in the event that cardholder information is compromised. Therefore, if you want to continue to process card transactions in your city via a “swipe” equipment method, it is important that you commence the necessary steps to protect your entity from any liability by switching to an EMV Compliant payment processing vendor. Currently, we have already completed one software interface, and are in the process of developing more, with our partners at PACE Payment Systems and Payment Services Network (PSN). The Jayhawk electronic payment module interface is now available for purchase and is the same price regardless of which vendor you choose. The vendors we are currently working with each provide a variety of services to meet your needs, including no cost options for your city by way of convenience fees to your customers. Please view our previous News posts about these vendors for more information about what each of these providers has to offer so that you can choose the one that best meets your needs. You will want to start this process as soon as possible as this shift in liability has already gone into effect. If you have any questions, or if you are ready for a quote for an interface with one of the above vendors, please email sales@jayhawksoftware.com or call us at 620-365-5156.